One of the greatest legends the game has ever known, Martina Navratilova won 59 career Grand Slam titles (18 singles, 31 doubles, 10 mixed doubles) in her career. In 1983, she went 86-1 and won 16 of 17 tournaments. In 1981, she announced publicly she was a homosexual, and has fought for gay rights, as well as animal rights and been involved in many charitable organizations. 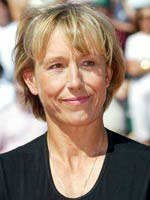 Navratilova is a breast cancer survivor and an author.